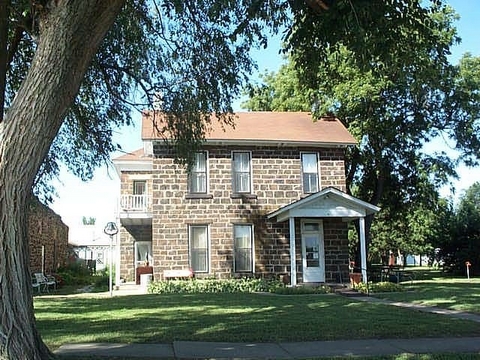 Ellsworth, Kansas, was one of our early destinations in our genealogical journey. We reached Ellsworth in June, 2001, when the winter wheat was ready for harvest. 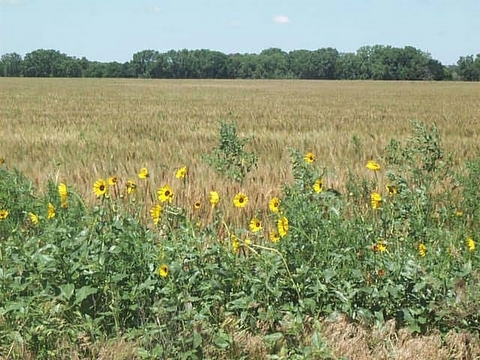 Winter wheat and wild sunflowers. The combine drivers who move from farm to farm were still a few towns away, but due shortly. In Ellsworth County, wheat, corn, beans and sunflowers seem to be the principal crops, but there are plenty of cattle ranches as well. Elsa's maternal grandmother, Ella Rowe, grew up in Wilson, Kansas. Like many young people of the 1880s who lived on outlying farms, Ella and her sisters came to Ellsworth for high school, boarding with families in town. One of Ella's teachers was Charles Cadwell, who was working his way through college by teaching in his old school. Just as in a romantic novel, Ella and Charles fell in love. We had very little information about the family, which made this a good place to start, because each nugget of information gave us new names and relationships to explore. Our first stop in Ellsworth was the Historical Society. Ellsworth Historical Society We found its home in a trim small stone house near the center of town (almost everything is near the center of town). When we mentioned the name Cadwell to the historian, she smiled, disappeared into a back room, and returned with a photo of the entire Cadwell family -- Charles, his brothers and sisters, and his parents. It had been taken about 1895, when all of the children were grown or almost grown and the parents looked mature. We'd never seen this photo before. Later we learned that just about everybody in the family has a copy and still later we found Ella's own copy, buried in an old scrapbook. In genealogy discoveries can come in any order. 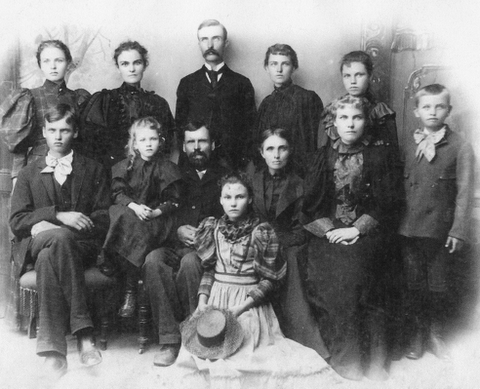 We stared and studied and began to become acquainted with this family, and before we left Ellsworth we had Simon Cadwell's family 1892 added many stories to our files. Our new friend, the historian, pointed us to the owner of a Western store, and to Elsa's mother's first cousin Nancy who still lives in Ellsworth. We visited both, soaking up stories and gossip and speculation and making new friends. All of the Cadwells were born in a sod house, at least that is the way the newspaper obituaries and some family memories go. At the courthouse we found the local land records and identified the farm where the Cadwells had lived. Thanks to cousin Nancy, who seems to be friends with everybody in Ellsworth, we got permission to visit the land, which is now just an overgrown field. At the end of a barely visible dirt track we found the remains of the house which had been built for the growing family over a hundred years ago. It was a large old stone house designed and built by the famous (in Ellsworth) "Z" Jackson. Great-grandfather Simon Cadwell had to wait until Jackson had completed the Ellsworth Opera House for his fine new mansion to be erected. While waiting for the stone house the family did indeed live in a "soddie," and that was the preferred story for pioneer historians! Ellsworth County is rectangular, 30 miles wide by 24 miles high, or exactly 20 Townships, each 6 miles on a side. The two largest towns are Ellsworth, population 6000, and Wilson, population 2000. There are three smaller towns: Kanopolis, about 700, Holyrood, perhaps 500, and Lorraine, maybe 300. Carneiro (Portuguese for sheep fold) might have 100 souls, and the rest of Ellsworth County lives on their farms and ranches. The most impressive establishment is a large natural gas compression station; elsewhere, a few oil wells pump along in the middle of fields. Over the years the agricultural output has grown steadily while the population has steadily declined. The history of this part of the world is pretty simple. It was Indian Territory until the U.S. decided to open it up for settlement in 1862. The railroads came through, putting up small towns for the workers along the right-of-way; some remained as loading stations for cattle on the way to market. Cavalry forts were built to protect the railroads and early settlers, (or to drive out the Indians, depending on your view of history.) Saloons were the first commercial establishments in these towns. The early inhabitants were pretty lawless. Granite fence post Texas cowboys drove their herds of longhorns along the Chisholm Trail, despite the objections of the local Kansas ranchers who feared ticks (longhorns were immune, domestic cattle sickened) and tried to guard their water holes for their own cattle. Other settlers came to farm the land, putting up fences and planting crops. 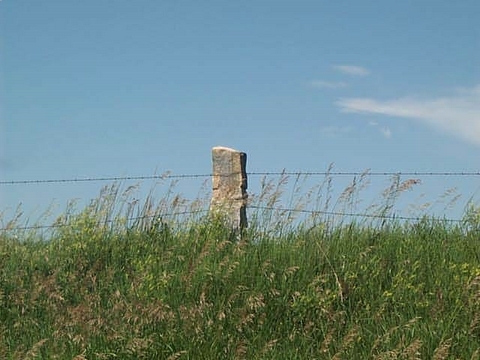 On the treeless prairie, fence posts were cut from granite. Droughts, long winters in which entire cattle herds froze to death, prairie fires and plagues of grasshoppers -- all of the disasters Laura Ingalls Wilder and Willa Cather have described befell the Kansas ranchers and farmers. 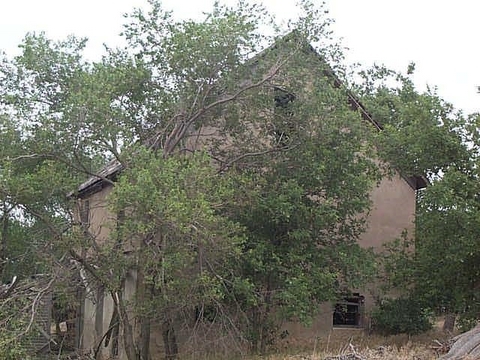 By the turn of the century it became fashionable for wealthy easterners to buy a Kansas ranch and invite friends to play cowboy over the summer. A few remained as serious landowners. Nowadays Ellsworth folks grow winter wheat and feed crops, and raise some beef cattle. 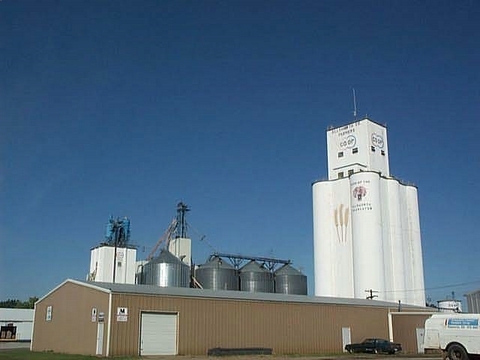 Ellsworth Grain Elevator Nancy shared with us her recollections of farm and ranch life and some choice Cadwell family stories. We now know how to detect rye amidst the winter wheat (it sticks up higher), and we understand how a life of farming marries you to the land. Nancy took us to the Buckeye Cemetery, out in the country on a dirt road, but immaculately kept, with solid granite stones, and filled with family and friends of old. Charles and Ella Cadwell raised their family in Cleveland, Ohio, and Elsa grew up ignorant of her rich Kansas heritage. In retirement we began to piece together our family history.